Hi Allison, this is Steve back with a product review … well actually more of a product comparison. In my endless quest for the perfect sports headphones, I’ll compare the PowerBeats3 Wireless headphones that you recently got me for Father’s Day (thank you very much!) against the previous pair of headphones I used, the older model Jabra Sport Wireless+. As another comparison point, you can check out Allister Jenks’ excellent review of the BeatsX bluetooth headphones back in March. Both the PowerBeats and Jabra Sport are Bluetooth headphones designed for use on the go or while involved with physical activity. Both headphones are wireless and connect to a Bluetooth enabled device, such as an iPhone. Both have external controls for volume, pause, skip ahead/back and call answering. You may have heard me talk about how almost all regular earbuds do not fit in my ears at all. For example, I haven’t been able to find a pair that will stay in my ears while running. So I depend on headphones that have hooks that attach the earbuds to my ears. Both the PowerBeats and Jabra Sport have these ear hooks to keep the earbuds in place while I’m active. Bottom line is that I like the new PowerBeats3 headphones but there are still some situations where I prefer the Jabra Sport headphones, so I use both now, but each in different situations. Now I’ve talked about these headphones’ similarities, so let me talk about where they differ. First on fit. To me, how well wireless sports headphones fit the ear is one of the most important features because it’s very distracting to have headphones coming loose from my ears while I’m running around or working out. In this category, the Jabra Sport headphones do very well. They stay secure in and around my ears while running, working out … any physical activity I’ve put them through yet. The PowerBeats do a pretty good job here but don’t stay as securely seated in my ear canals while moving around. As a result the PowerBeats’ sound quality suffers when they become unseated and I find myself having to re-seat them more often than I’d like. Unlike the Jabra Sport, the PowerBeats have adjustable ear hooks which I thought I could adjust to solve this problem. After several tries however, I haven’t been able to find a hook shape that keeps the earbuds securely in my ears while I’m active. But they do stay in place fairly well when I’m not moving around too much. I’ve also tried the several different sizes of silicon tips that fit on the PowerBeats earbuds, and although some work better than others, none keep the earbuds as securely seated in my ear canals as the Jabra Sport. So advantage to Jabra in the fit category. Set up is the next comparison, although not a fair one since the PowerBeats contain Apple’s W1 chip. Initial pairing with my iPhone was very easy just like Apple’s AirPods. I just pressed and held the PowerBeats3 power button and an onscreen message came up on my iPhone asking if I wanted to pair. I replied yes and that was it. Even better, once I paired the PowerBeats with my iPhone, they magically appeared as a Bluetooth device across ALL of my other Apple Bluetooth enabled devices (both macOS and iOS) ready to connect, without having to re-pair with each of them. Although straight forward, the Jabra pairing process was old school. I had to pair the Jabras with each Bluetooth device I used them with using the more traditional paring method. Next lets talk about Bluetooth connectivity. This is often a weakness with wireless sports headphones. Many of them intermittently lose connectivity or drop the Bluetooth connection all together depending on how the headphones are oriented on the body with respect to the Bluetooth device they’re paired with. I think this is caused by the body acting as an absorber of the Bluetooth signal. The Jabras do a decent job of maintaining connectivity for me (although Allison had some issues with the pair she tried). I’ll occasionally have a brief dropout with the Jabras but I rarely lose the Bluetooth connection where I have to repair. The PowerBeats excel in this area and maintain a solid Bluetooth connection with my iPhone, even while running or moving about. Again, advantage to PowerBeats. Battery life is always a big factor with sports headphones. 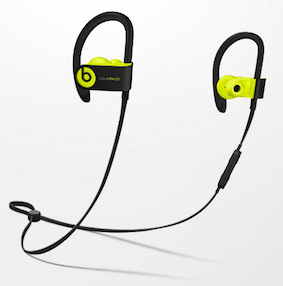 Here’s where the PowerBeats really shine. My typical workouts last about an hour or so. I can only get two, almost three workouts out of the Jabra Sport headphones until I have to recharge them. The PowerBeats on the other hand are advertised to provide 12 hours of battery life. I was skeptical until I tried them and was pleasantly surprised the PowerBeats lasted a good 10 workouts with some battery life to spare. Also you can recharge the PowerBeats for only 5 minutes and get about an hour of additional use. Advantage clearly goes to PowerBeats in this category. Finally let’s compare sound quality. Both headphones produce good audio. The PowerBeats’ high frequencies are very crisp with good sound separation in comparison to the Jabra Sport sound which is a little muddy. But the Jabras have better bass response and good mid range sound compared to the PowerBeats. Although this is a very subjective comparison, I like the PowerBeats sound quality better for music listening and the Jabra Sport better for listening to podcasts. So let’s summarize: The PowerBeats beat the Jabra Sport in the areas of set-up, bluetooth connectivity and battery life. The sound quality of both are good. But the Jabras stay in my ears better than the PowerBeats. So I now do my more active workouts with the Jabras and my less active listening with the PowerBeats. The PowerBeats3 sell for $162 U.S. on Amazon and the Jabra Sport Wireless+ were $50 when they were available for sale. 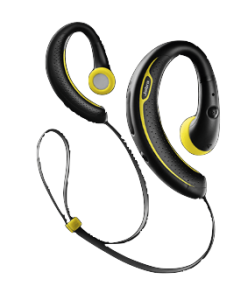 However their replacement, the Jabra Sport Pace, sells for $60 on Amazon. And of course there are Podfeet Amazon Affiliate Links in the show notes. So until my next review, that’s it for now Allison … oh, and you can be sure that I will stay subscribed.